We are so so slow at unloading deadwood, that's the reason we never get any money back. You could tell he wasn't good enough after one year. Fine, give him a second year as benefit of the doubt, but 5 years? really? If we had sold him after 2 years he would have been a 26 year old international CB that has played for Utd, we would have got a reasonable return. He's now a 29 year old CB that's hardly played for years. We will get peanuts for him. The other big clubs would have gotten rid of him long ago. Rojo would make a great mascot. Delighted to see him training with another club in Argentina. Hopefully this means the end of Rojo at Manchester United. He's been a financial drain on us for years and we've typically done nothing about it! Other big clubs are ruthless with failed signings. If they get the whiff of a flop, they try and get rid ASAP while the player still has value. We dont operate like that usually. Now it is widely acknowledged that he's not that good of CB. In the past, Rojo was a stick I used to see which posters were knowledgeable about a CB. Forgot he and Darmian existed. Probably thought about Lee Grant more than these 2 combined. We signed him based on him being a starter for Argentina at the World cup. What a few years of transfer masters we had at this club, amazing stuff. I forgot he actually exists. He's still here ? About 30 decent games for Utd in 5 years and most of those were in one spell when Mourinho had sacked off the league and was just looking at a couple of easy cup runs in the LC/EL. Almost competent at CB, an utterly atrocious full back, think Bailly against Juve. He was good in that extended run - our best centre half that season. I’m attributing his range of average to poor displays prior to that to our deploying him at left back which, as you allude to, was not his position. It would seem the injury that year ruined him, he’s barely been seen since. So I think I look at him as having been quite unlucky here overall. Time to move on though. Wondering if he has already played his last game for United: currently training with Estudiantes with the permission of the club. I think LVG liked him because he was a left footed centre back too. 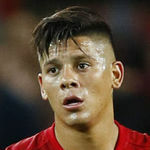 Also, whilst I do not think Rojo is the standard of player that should be playing for Manchester United, let's not forget that he has played well for us in patches. He'd make a good signing for other lower ranked Premier League clubs IMO. Rojo going to start next game? Shaw and Young suspended. Him v Felipe Anderson will be interesting battle. Rojo should get the hell out of this club once and for all! The amount of money he's earnt in wages compared to the games he has played is a joke. I noticed that also. And it’s a disgrace that we are even paying this guy a wage this long. I don’t want to see him play, ole should give some youngsters those minutes instead. I'd much rather we play Jones at RB and Dalot at LB than play Rojo. The guy is a walking disaster. For all the flak Jones gets, I'd take him every time over Rojo. Why we signed him will always remain a mystery to me? Cheap left footed LCB, cover LB/LWB for Aloysius. If he has to play(and I hope he doesn't) it can only be at CB. Defensively he is one of the worst full backs I have seen play for Utd, so easy to go past on the dribble, no awareness of danger around him. Decent at competing for a ball when the player is backing in and the odd nice pass among his many hoofs but he is a terrible full back. Done well in the build up for the first penalty but it comes as no surprise to anyone that Rojo is not good at full back. Even more so when he's not played in forever. Williams from the academy should have been given the chance today. Showed some spirit at least unlike others. He's awful at centre-back as well, his man-marking ability is non-existent. We already knew that, don't know why people are surprised. It was obvious what was gonna happen today. Didn't get sent off and for me that counts as a good performance for Marcos Rojo. He always was a liability at LB here, that's on Ole. I can get why people stand up for so many other players. Not with Rojo, about 25 good games in 5 years. Throwing an 18 year old with no professional appearances into the deep end would've been a very poor decision. Maybe cause his last-name means Red in Spanish? Only plausible explanation I can come up with. Hilarious player, that is all. Just a terrible player. Dumb as a post. I'll be glad when he leaves. If he's the worst defensively, why trust him as CB? Hopefully that's the last we've seen of him. LVG bought him as a ball playing defender.....ball playing! The mind boggles. I don't, just that he is far, far, far worse at LB. You would think a CB would at least have the basics of defending down but Rojo goes to full back and he thinks he is Roberto Carlos, wants to charge forward when he doesn't have the running power to get back, is astonishingly easy to go past one v one. At CB he can hide some of his deficiencies by battling, playing a highly physical game, confuse a few that he is decent. He is an awful player really. I'd have more positional awareness playing blindfolded, stealing a living at United. Performance is as expected of Rojo playing as LB. + biting tackles, dark arts of football, help passing from the back, recycle possession around, overlap, join attack, and have a fair go shooting outside box. - lose easily against pacy and tricky attackers, tend to give too much spaces behind him, over quick high press, and don't know who to mark. Never seen him play consistently stable and good as LB. Always erratic. I was hoping he could finally break that streak, since Ole is starting him so maybe he impress during training. Unfortunate.